With Dynatrace Log Analytics, you gain direct access to the log content of all your system&apos;s mission-critical processes. It&apos;s easy to search for specific log messages that you&apos;re interested in. Log content can be filtered based on keywords or timeframe. You can even analyze multiple log files simultaneously—even when log files are stored across multiple hosts. Most significantly, Dynatrace artificial intelligence automatically correlates relevant log messages with any problems that it detects in your environment. Relevant log messages that are associated with problems are then factored into problem root-cause analysis. To enable Dynatrace Log Analytics, just make sure that you&apos;re running the latest version of Dynatrace. All new log content from important processes will then be auto-detected and monitored. There&apos;s no need to copy or export log content to external storage to facilitate analysis. For full details, see How do I enable Log Analytics?. 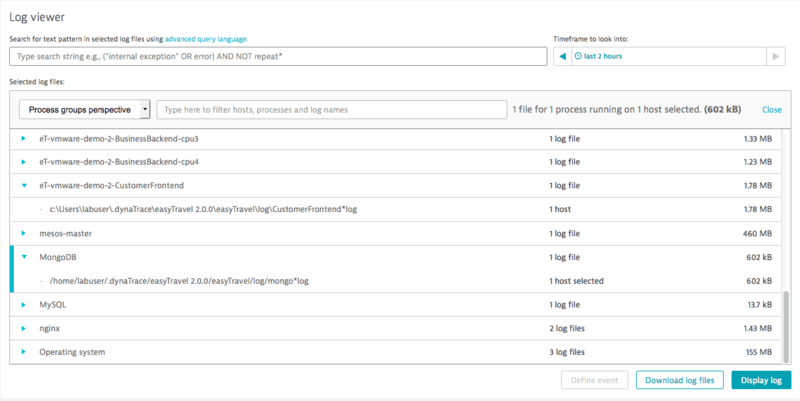 When Dynatrace detects that a certain process is the root cause of a detected problem, an Analyze process logs link is displayed on the corresponding Problem page. Click the Problems tile on your Dynatrace homepage. Click the Analyze process logs link beneath the root cause section. The Log viewer appears pre-loaded with all problematic process log entries that occurred during the problem timeframe. Using the Log viewer you can directly analyze log content and find problematic log messages that will help you understand the root cause of problems detected within monitored processes. The Log viewer enables you to browse through process logs, manually selecting individual logs for ad hoc analysis. Alternatively you can search across selected process-log content using keyword search and filtering. Search queries can be saved for reuse later. You can even opt to have log results returned to you raw or in aggregated form. Extensible and easy to learn, the Dynatrace search query language enables you to filter out all log lines except for those that are of interest to you. For full details, see search query language. When you identify specific patterns in your log files that indicate problems or potential problems (i.e., messages that match specific search criteria), you can save the patterns for automatic detection by Dynatrace artificial intelligence. This way, the next time Dynatrace encounters the saved log pattern, it will automatically generate a new problem for tracking and root-cause analysis. From the left-hand navigation menu, select Log files. Define a search query and select logs for analysis. At the bottom of the Log viewer, select a timeframe (i.e., scope) for the query. Click Display log to view the search results. When happy with your query - click "Define event" button. Fine-tune the query or scope, if needed. Select the event type (Performance, Availability or Error) that best describes the searched pattern. This affects how the event will be correlated with other events. Modify the frequency threshold (if needed). All event definitions are available at Settings > Log analysis. You can only select logs, time frame, and search for text patterns within the selected log files. Automatic parsing and result filtering isn&apos;t available. Note: The above limitations are removed when you upgrade Log Analytics.